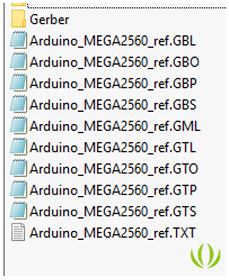 ← How to generate PCB Gerber files? Exporting manufacturing files from Eagle is very simple and the least likely to run into problems. With the use of pre-configured CAM job files, there is no need to change export settings. 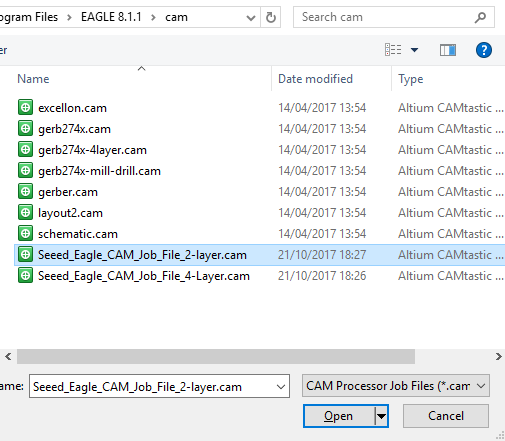 Even better, in the later versions of Eagle, the Seeed Fusion CAM job file is built-in to Eagle directly. So, there is no need to download any files or change any settings. *This applies to Eagle versions 9.2 and above, we recommend updating to the latest version of Eagle to make use of the latest upgrades and fixes. Guides for previous versions are also included below but please be careful when using these since we can no longer guarantee compatibility. For extra insight into Gerber generation in Eagle and the CAM job file, check out the blog post. 1. Click the CAM Processor button (the one without the green arrow) on the main toolbar. This will bring up the CAM Processor window. 2. Click the document icon next to the CAM file name and go to Third Party -> Seeed Fusion and select the CAM file appropriate for your design. Please be sure not select the 4-layer option if your boards contain only 2 layers and vice versa. 3. Use the Gerber previewer on the right to see what data will be exported in each of the Gerber layers. 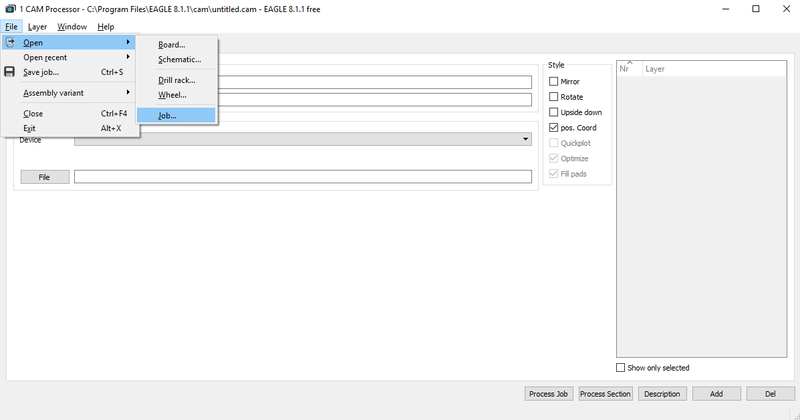 Then choose whether you want the files exported in a zip archive file or not then click Process Job. 4. Job done. We recommend using a separate Gerber viewer, like the one available after uploading the zip file on the Seeed Fusion order page, to double check the files have exported correctly and that all the necessary files are present. If everything looks good then, then order away! 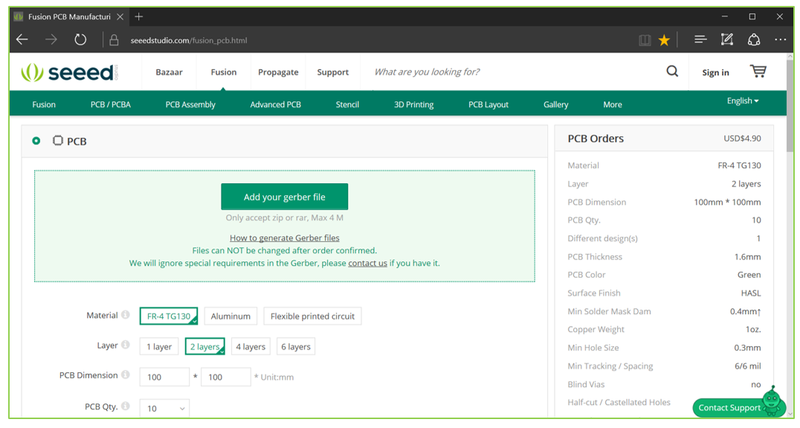 The exported files should contain all the manufacturing information needed to produce the PCB boards. If you have special requirements or are not sure if something has been indicated correctly in the files, please check out our FAQ or contact us directly. 5. Upload the archive directly to the order page and verify the design looks correct on the online Gerber viewer. Then you can add it to the cart and proceed to the check-out. - No CAM files: If you cannot find the Seeed Eagle CAM files, please update to the latest version of Eagle. The built-in CAM job files were only included in version 9.2 and above (the files didn’t make it to the 8.6 update). - The solder mask Gerber layers are unintentionally filled: Please ensure that the negative polarity option is unchecked. - Milling and cut-outs: Milling slots and cut-outs can be drawn in the milling (layer 46) or dimension (layer 20) layers. We recommend that you draw the outline of the shape only with a thin line for precision. - Higher level multi-layer boards: We only have CAM files for 2 and 4 layer boards. If you have a greater number of layers, please open the four-layer CAM file and create the extra layers following the inner layers of the 4 layer CAM job file as a template. 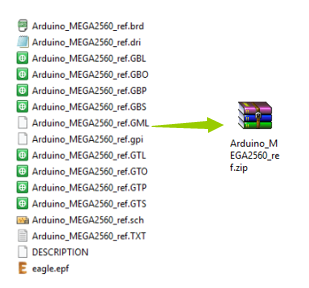 - Some information not exporting to the Gerber files: Verify that the Eagle layer is listed in the Gerber export settings for the layer you want the information to be exported to. For example, the milling Eagle layer should be included under the Gerber mechanical layer settings for it to be included. Then verify that the data appears in the preview. - Inner layers are not showing oval shaped clearances for plated slots: This is a problem with the Eagle software. Please manually draw the slots in the milling layer to ensure the inner layers are isolated. - For Eagle 8.6 to 9.1, please update to the latest version of Eagle to access the built-in CAM files. 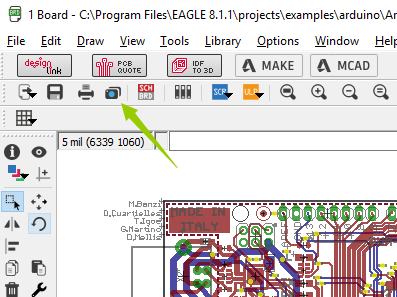 Open your design in Eagle and find the CAM icon, this will bring up the CAM Processor. Locate the correct CAM file for your boards and open it. Please make sure you are using the Seeed CAM file, the default Eagle 274 files will not export the files correctly and may result in errors. 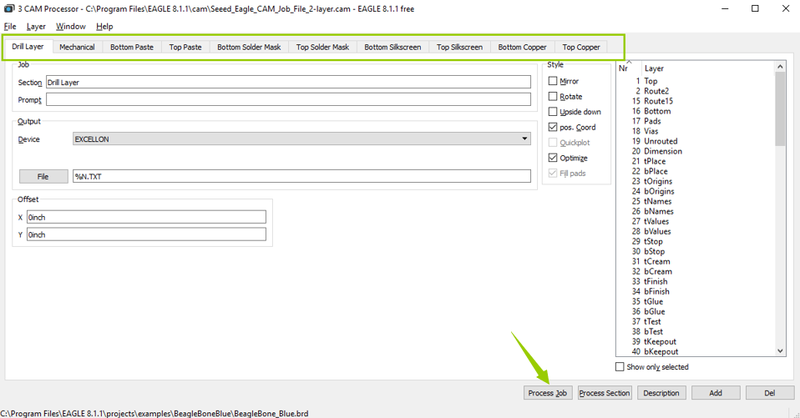 The CAM file will export all the required layers, including the drill file in Excellon format and will label the files with our preferred extensions. Click Process Job to begin the export process. The manufacturing files will be exported in the same location as your design files. Please check that the ten manufacturing files have generated. Place these into an archive and upload this onto the Seeed Fusion order page. We recommend that you give the files a quick check using the online Gerber Viewer before confirming the order. - The board outline and any cut-outs, v-cuts and milling should be drawn in the Dimension or Milling layers (layers 20 and 46 respectively). Try again, an error may have occurred during the export process. Make sure you have loaded the Seeed CAM file and not a different one. Check that the CAM file is still configured correctly. See below. Check that all the layers are present and designed correctly in your Eagle design files. - Please do not use the 4 layer CAM file if your boards are only 2 layer and vice versa. We do not have a CAM file for single layer boards. For single layer boards, please use the 2 layer CAM file and then delete the data for the extra side e.g. GBL, GBS, GBO etc. - If the PCB was not designed in Eagle then you may have problems getting all the data correctly exported. Please check all the that the necessary information is located in the Eagle layers below. You may need to select other layers in the CAM file if your data is located in non-standard Eagle layers. How to generate PCB Gerber files? How to generate the Gerber (manufacturing) files?